Check out the haunted story behind the Old Alton Bridge coming up October 1, 2008. I will provide a link HERE when it posts. Our family enjoys spending time with our three little boys every chance we get. Sometimes we go out to eat (only at places with play areas), sometimes we go for a stroll around the neighborhood, and sometimes swimming at the lake. Occasionally we will go hiking with the kiddos and have found a couple favorites that are kid friendly. The best place so far that our kids really seem to enjoy going to is the Elm Fork Trail off of Old Alton Road near the Copper Canyon, Texas area. A feature to this location is the Old Alton Bridge which some claim as haunted and the area is actually maintained by a paranormal investigative group. 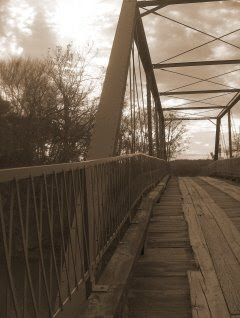 The bridge also lies near the site of a famous shoot out in the summer of 1878 with legendary outlaw Sam Bass and the bridge was posted to the National Register of Historic Places on July 8, 1988. The trails are fairly easy for children and are accessible to horse riders. You can also fish here and it is a popular fishing spot on the weekends. We have caught many a sand bass in the waters and have even seen alligator gar here. If you hike the trail to the left, it will take you approximately 1.5 miles through open and wooded areas passing by a ranch until the trail becomes nearly impassable—especially in wet conditions. If you take the trail to the right which is actually the Pilot Knoll Trail (walk over the Old Alton Bridge), you will pass another ranch. Our kids especially like the donkeys and we have even seen a couple wild turkeys. Soon you will cross a dry creek bed (at least when there hasn’t been recent wet weather) and the trail will turn sandy and will rise in elevation. This is where you should stop (at the creek bed that is) if you have small children. We made the mistake of going further and ended up with three very upset children. There is lamb’s ear in this area, and that was neat to show the boys. We haven’t gone much further than this on the trail, however if any of y’all make it further, I am curious to know what is ahead. We don’t usually get very far on hikes with our three small boys, but I believe we went approximately four miles that way (round trip). I recommend taking a small lunch and lots of water. Please pack out what you pack in and most of all have fun! You r really good @ this blog thing! My husband and I just found the trail and bridge while we were out for a drive.We didnt go far in, just checked out the bridge and figured I check more about it on line, thanks for the info, we will be going back for a hike next weekend. The hike is a wonderful hike to take. Especially with the nice weather. Go early if it is going to be hot. for a map of the area! For a video describing why the Bridge is haunted. For those of you who have visited this trail/bridge, what did you think of the place? I had no idea about this either! LOVE it. We will check it out when it gets a little cooler.